In Policies for boosting arts demand I build on my argument that Australian cultural policy needs more demand-side policies. The case is based on the observation of recent data on the Australian cultural sector and some simple economic supply and demand modelling. This post supplements these articles by explaining the modelling process and reasoning that underpin them. This is a rough draft – I welcome comments or suggestions. Recent data suggests that the Australian arts sector is grossly ‘oversupplied’. In the first decade of the century, Australian participation in creative arts work increased dramatically – in some arts activities it more than doubled or tripled! At the same time, artists’ relative incomes have declined. The Census, for example, shows that the full time incomes of artists dropped by $4,000 relative to other professionals. The figure below puts the two trends together to illustrate how dramatic the inverse relationship has been between involvement in creative arts practice and artists’ incomes. These are classic signs of a sector straining under the weight of labour supply: increases in labour supply tend to reduce wage rates, which is likely to be reflected in declining incomes. Australia’s cultural policies predominantly work on stimulating supply, and so are likely to have made matters worse. In my Culture360 article I compare demand-side and supply-side policies across a range of dimensions. One of those is the economic dimension, where I argue that demand-side policies increase arts production and put ‘upward pressure’ on arts incomes. More policies to stimulate demand could, therefore, bring some much-needed balance to the sector. These conclusions come right out of the most basic form of economic supply and demand modelling. 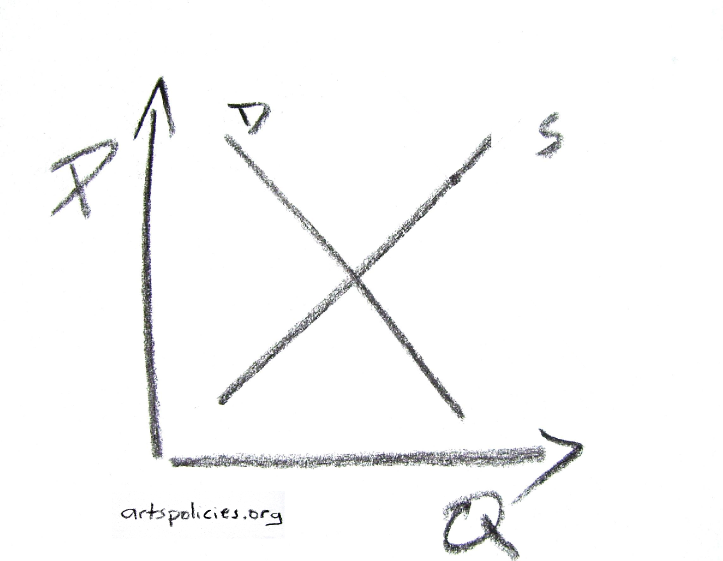 If art is assumed to have demand and supply curves similar to any other goods or services, then the arts sector, or arts industry, can be modelled like any other market using standard supply and demand curves and the technique of ‘static dynamics’. This post runs through the model to explain how the policy impacts in Policies for boosting arts demand were derived. The most basic way economics models a sector is by using supply and demand curves. These curves provide a way of thinking about the sector as a ‘market’. Though limit ed and very basic, this modelling technique is a useful starting point when thinking about the impact of government policies. The model is based on a Cartesian space, such as that in the figure to the right, with price on the y axis and quantity demanded and quantity supplied on the x axis. Economics recognises that quantity demanded and supplied will depend on a lot of things, not just price, but price holds a special fascination for economists. Modelling price can bring a lot of insights into the analysis of a sector and the likely impacts of policy intervention. The demand curve shows the quantity of art demanded at each price level. As with other goods, the art demand curve slopes downward: few people are willing to buy art at higher prices, more people are willing to purchase art at lower prices. The peculiar nature of some art means that there may be caveats and exceptions to this rule, but on the whole I believe it’s a worthy way to model the bulk of exchangeable artistic and cultural experiences. If in doubt, think about the market for theatre performances and literature: When theatres use different prices for different audience segments, they are demonstrating that the performing arts have a standard downward-sloping demand curve; and the hullaballoo that often surrounds book taxes and the parallel importing of books demonstrates the same for literature. Supply works in the opposite to demand. The higher the price of art, the more producers are willing to produce and sell art. They are not so willing at low prices. The supply curve slopes upward. The two curves meet at the price at which quantity demanded equals quantity supplied, at the holy grail of economics – market equilibrium. At equilibrium, there is q1 amount of art exchanged at price p1. The total amount spent on art, or the arts sector’s revenue, can be calculated as q1 x p1. This is represented by the area in blue. The model is obviously a major simplification of the ‘real world’. Perhaps it requires too much of a leap of faith for some. If you don’t buy this modelling concept, read no further. Bear in mind, though, that there could still be benefit in suspending disbelief for just a moment. As with all models, these are tools to think about the real world. They are not supposed to be perfect replications of the real world: models that did that would be impossibly complex and would miss the point of modelling. Below I run through the simple analysis of what happens to the ‘arts market’ under two scenarios: supply-side policy intervention; and demand-side policy intervention. Demand-side policies act to encourage demand for art. Culture vouchers, for example, allow consumers to attend a performance or buy an art work at a price they were previously not able to buy at. The effect of demand-side policies is, therefore, to increase the amount of art demanded at each and every price. This equates to a shifting of the demand curve outward, as in the figure to the right. Total revenue of the arts sector increases (an expansion of the revenue rectangle). A demand-side policy leads to an expansion of the sector, with both quantity demanded and quantity supplied increasing, and total sector revenue going up. If there is no change in the number of artists and arts workers, there is more revenue to share across artists and arts workers, so demand-side policies are likely to place upward pressure on arts incomes. Supply-side policies act to encourage art supply. Grants, for example, allow producers to produce art at prices they were previously not able to produce at. In other words, supply-side policies increase the amount of art able to be supplied at each and every price. This equates to a shifting of the supply curve outward, as in the figure. Total revenue of the arts sector changes (from the blue rectangle to the red rectangle). The supply-side policy leads to an expansion of the sector – with quantity supplied and demanded both increasing – but an ambiguous impact on total sector revenue. Whether total revenue goes up or down depends on the relative sizes of the blue and red rectangles. It is not always obvious which is bigger, and this depends on some seemingly random matters such as how the demand and supply curves are drawn, and how far the shift in the supply curve is drawn. In Economics, these are determined by things called elasticities. Elasticities determine whether total revenue will go up or down when the supply curve moves, and how far the curve will move in response to policy intervention. There has been quite a bit of research done in cultural economics about the elasticities associated with arts goods and services. (See Bruce Seaman’s exhaustive review of elasticities in the performing arts, Attendance and Public Participation in the Performing Arts: A Review of the Empirical Literature). The results of this highly technical research are inconclusive, although the majority of studies have found performing arts to be price inelastic, which means that total revenue will drop with a decrease in price. Inelastic arts demand also seems to fit well with the expectations of Cultural Economists. The data presented at the top of this post suggest that expansion in the Australian arts sector, as highlighted by increasing number of people involved in arts work, has indeed led to declining relative incomes. The data are consistent with a supply-side expansion causing downward pressure on artist incomes. Although policies are unlikely to be wholly responsible for declining incomes, the trend does follow after a substantial expansion in Australian government supply-side support through the ‘Howard years’, so supply-side policies will certainly not have helped. It is probably the greatest – and possibly least understood – paradoxes of contemporary arts policy: that the very policies used to support the arts also put financial pressure on arts incomes. The comparison of supply and demand curves between two points in time is known as ‘comparative statics’ analysis. This rather clumsy technique is necessary in standard economic supply and demand curve analysis because time is not included in the models. But not including time in the models can lead to some difficulties in interpretation. Long-term impacts of policies are likely to differ substantially from short-term impacts. It is not easy to decide which is most important or how long the changes modelled will last. The analysis above has already struggled with temporality: in predicting income effects, for example, it was assumed that the number of artists didn’t increase or decrease. But this is a rather strict condition that is unlikely to equate to the real world, where people can enter or leave the arts labour market. If increased revenue leads to increased arts incomes, more people will likely be attracted into the arts labour market, and this could drive average incomes down. In the long-run, higher average arts incomes could be competed away by new entrants. There are good reasons to believe that this effect is very real in the arts labour market. Arts occupations tend to have low barriers to entry. Anyone can, in effect, call themselves an artist. Artistic success or failure is measured more by talent or the quality of art works than by the holding of a qualification or professional memberships (unlike other professions, such as law and medicine, in which formal documentation is a prerequisite for practice – no coincidence that these professions also tend to have higher incomes). Two other aspects of arts work would facilitate the ease of entry into artist professions: first, people with an artistic ‘bent’ have a profound preference for working in the arts – a tendency formally recognised in David Throsby’s ‘work preference’ model of the artist labour market; and second, the multiple job-holding and contingent employment patterns of arts workers mean that there is a ready ‘pool’ of potential entrants into the arts labour market, many of them with high levels of experience and ability. With such ease of entry and exit into and out of the arts labour market, supply of arts labour will move relatively quickly – ‘elasticly’ – with changes in arts income levels. Modelling policy impacts with demand and supply curves suggests that supply-side policies will expand the arts sector but lower the arts price. If arts demand remains unchanged and the demand for art is price inelastic, supply-side policies can put downward pressure on arts incomes. Data shows this occurring recently in Australia: when creative arts practice expanded dramatically between 2001 and 2007, artists’ relative incomes declined. Modelling suggests that Australia’s predominantly supply-side cultural policies will have done little to alleviate, and may have even accentuated, the decline in artists’ relative incomes. It also suggests that demand-side policies could alleviate some of the downward pressure on artists’ incomes by expanding arts sector revenue. See also Damned lies and economic modelling (Sydney Morning Herald, 1 February 2012), in which Gittins looks at some of the ways that advocates and lobbyists misuse economic modelling, many of which I raise in the context of art and cultural policy in Using economic’ impact studies in arts and cultural advocacy: a cautionary note, Media International Australia Incorporating Culture and Policy, no.98 (February), 2001. Gittins’s articles seem to have been prompted by the release of an interesting – though rather shoddily presented – research report released by the Australia Institute, The use and abuse of economic modelling. To view the data, see Australia’s Creative revolution and section 3.2.3, page 70, of Compendium of data on artists’ work and employment in Australia. This entry was posted in Cultural policy, Economics of the arts, Research tools, models, analysis and tagged Arts policies, Arts policy, Cultural economics, Cultural policies, Cultural policy, Economics of the arts, Linkedin by Christopher Madden. Bookmark the permalink. Thanks for making a fundamental point in an accessible way; and good to see some reasoned analysis of economic data in relation to the arts. As I argued in Realtime #96 http://www.realtimearts.net/article/96/9805 there is a need to reexamine the economic and policy basis of arts funding, and frankly for the arts community to get over its fear of economics and make reasoned arguments based on the fundamental policy design principles of equity and efficiency, if we are ever going to persuade the pointyheads at the Departments of Treasury and FInance. The argument about an possible oversupply of artists was first made by David Throsby and Glen Withers’ in their landmark “The Economics of the Performing Arts” published in 1979. Professor Throsby has gone of course on to be the doyen of cultural economics and to describe ways that cultural capital may affect the standard microeconomic models you use here. Hans Abbing has been the academic taking forward the ‘oversupply’ mantra more recently (‘Why are artists poor’ book and papers: http://www.hansabbing.nl/DOCeconomist/Publicaties.htm). I enjoyed your Realtime article, though note in my past articles and upcoming article I advocate arts consumer support rather than artists and arts organisation support. A good point about the education institutions. I produced some data on this in a compendium for the Australia Council and DEWHA: section 3.4 (http://artspolicies.org/2010/07/02/compendium-of-data-on-artists-work-and-employment-in-australia/). We argued that a steady stream of graduates has added to the problems of oversupply. I would also note that tertiary arts institutions have a vested interested in churning out “artists” no matter what the conditions in the marketplace. I have been arguing for years that we have e.g. far too many tertiary music schools of mediocre standard focussed on orchestral playing where there is a fixed (and very small) number of jobs, and that those institutions are being grossly irresponsible to encouraging kids to think this is a viable career choice. Guess what? Their funding depends on the number of students they can enrol. I think increasing demand-side policies is a great idea – keeping in mind that various art forms have different kinds of demands. Some forms of art this may require more thoughtful policy than others. While the price of buying a ticket to a theatre show or buying an original piece of art by an emerging artist could be subsidised, installation art (for example) isn’t appropriate to sell to individuals. More often it is sold to large art institutions – so in this case perhaps large art institutions could be given bigger budgets to directly commission installation works. It might be interesting to see ARIs be funded to commission one larger scale work a year – sometimes grassroots level organisations are ‘closer to the action’. Ultimately, while I would like to see the income of the artist rise I am inclined to believe a big, poorly paid art industry is better than a small, well paid one. My curiosity is more about how policy might serve to ensure the distribution of arts-related incomes becomes a little bit fairer. Without taking away much needed funds from the minority who are making money from making or facilitating art, how might we create more opportunities for artists who are volunteering, curating and showing work in small-arts-organisations/ARIs to get paid? I agree that some art simply isn’t ready for broad purchase – maybe the very keen (or exceedingly wealthy) could pay Christo to wrap their house! Finding the balance between broad and narrow support is the age old problem of cultural policy. The now famous post-war Beeldend Kunstenaars Regeling (BKR) scheme in The Netherlands ended up spreading its support wide. The policy impelled local governments to buy works of art to ensure artists had a stable income. The result was a substantial increase in the number of ‘artists’ and a huge stockpile of art works that simply sat in basements and needed to be ‘disposed’ of when the unsustainable policy finally fell apart. The links below describe BKR. The scheme’s failure might be put down to bad policy design, but I’m more inclined to think that policies with a wide focus will tend to end up chasing an extremely ‘long tail’ of artistic practice, end up unaffordable and result in bad art. In the end, it is a focus on artists’ earnings that I believe is a failure of policy. Often this objective is implicit for fear the arts will be seen as ‘rent seeking’. But on occasion, as with the Australia Council just recently, boosting incomes has been an explicitly stated strategic goal. The problem is, supply-side policies are the worst way to achieve this goal. And, by putting downward pressure on incomes, policy will be in effect chasing its own tail. Hi Christopher, I just came across your article on Facebook and quickly checked the Culture360 web site. As Gavin says you have put the economic concepts in a very clear way. I’m not sure what you intend this article to do. It seems ok as a theoretical idea but without any actual context I am uncertain as to the value. I agree that the education sector is oversupplying the market, and Gavin articulates other parts of this well. I don’t agree with the premise of supply/demand with which you characterise the Australian scene at all. If you mean this article to generally approach the over supply of artist training it is fine and this needs to be stated. I think that by Australian cultural policy you refer to the arts and film funding policies mainly, I’m not sure. Presuming this is your main focus… The scene is too complex to make such broad assumptions without many caveats. While you mention some caveats you suggest that the overall theory will win out. It may for a theory excercise but for cultural policy to actually contribute in an active and useful way there are many holes in the system(s) through which the arts operate which must be recognised. We are presently bogged down with broad research and constructs which simply do not identify real issues and attempt to do something about them. There are parallel circumstances among the various artforms/sectors and there are major variations too in not so much the economic constructs as the overall infrastructure and “industry” settings. Some big holes in this. Over the years arts lobbying and media reporting has tended to articulate funding from the needs of the “industry” which in public discourse has tended to loose the idea that arts funding can be equally seen as subsidising the public to gain access to the arts. Conversely all government agencies report in terms of access and participation and play minimal attention to the actual needs of the supply side – with the exception of a few sectors. In about 1994-5 the Australia Council chair Hillary McPhee and GM Michael Lynch made a big deal about refocusing to support the supply side. You might know about this, I can’t remember the upshot. In the past two decades a great deal of money has been spent by the arts in gaining new audiences, particularly by the large companies and institutions, and successfully I think. Also a vastly enlarged arts scene has developed through the suburbs and regions of Australia, partly via the infrastructure, arts centres, arts officers etc. and by the emergence of significant numbers of professional artists outside of the major cities. Isn’t most of this establishing demand. In Australia the scale of the arts has vastly outgrown government interventions which reach only selected areas in any meaningful way. A switch to the demand side will not alter this. It has a snow flake’s chance. I’m all for well thought out policy based on theory but this must meet some actuals. If I have misunderstood your intent I am sorry and will be interested to hear. I’m pleasantly surprised that so many people have seen this post and taken the time to comment – my posts usually pass by with minor (or zero!) reference. I usually don’t worry too much about context and explanation, so I hope you will forgive me! I don’t think my Culture360 article will be made public for some time yet, so I apologise that I can’t provide the full details of my argument. But I can say that I make no claims at all about arts education – it is cultural policy that is the target of the analysis . This post was just intended to look at some lessons that might be gleaned from very simple economic models. The policies you mention that aim to encourage access have indeed in Australia been mainly supply-side policies. My upcoming article looks at the impacts of how supply-side and demand-side policies operate and the different incentives and impacts they have. I won’t go into them here, but hope when the article finally comes out they explain my position more clearly. PS Chris I picked up on your article through Marcus Westbury’s facebook post, which may account for the number of responses! Chris this was a very interesting article and I think Gavin’s points about tertiary institutions is also true. My concern with demand side policies, particularly in performing arts, is that there is nothing conclusive to show that this has worked. The Victorian model of ‘test drive the arts’ has not to my knowledge resulted in a new group of ticket purchasing patrons – rather they took the free tickets when available and did not continue (this is based on reports from companies and not any structured research – which probably needs to occur). Performing arts companies also report a drop off from patrons who are no longer eligible for the so called ‘youth’ tickets (how you can argue that you are a ‘youth’ at 30 still surprises me), but that could also be connected with a period of reduced discretionary income due to mortgages and child bearing/rearing that frequently occurs post 30 years. In contrast I suspect that some of those ‘Museum tickets’ you can purchase in the US and Europe have been quite beneficial. Do we need to have a multi ticket pass for performing arts companies? Interestingly, Chen finds that the KKR caused an increase in the price of artworks and the number of artworks purchased, just as the modelling predicts. But the evaluation also notes a range of problems with the policy. Makes for interesting reading. Yes, it seems the ‘Test drive the arts’ has been a bit of a mixed bag. The devil is always in the detail, and I wouldn’t want to endorse any particular policy until I had seen irrefutable evidence of its success. The evaluations of the visual arts loan schemes have been positive, but of course they have been done/commissioned by the organisations running them, conflicted and vested interests and all. The Dutch (usually more objective about cultural policy) have been heralding their culture card a great success. It’s interesting what you’re saying about youth tickets (apart from the fact that I think youth extends to the 40s these days!). It would be good to see some research into how much the ticket price plays in that drop off. I’m surprised a multi ticket performing arts pass doesn’t exist already. A very interesting discussion and all good points. From a policy design perspective we need to ask some fundamental questions: what is the market deficiency we are trying to correct? From Throsby and Withers’ perspective, arts incomes are not enough to get by on and so it is a welfare problem. The government wants to support arts. Should the government intervene to a) subsidise artists’ wages, b) reduce the supply of artists, or c) stimulate increased demand for the arts? Here we are looking at demand side, so (leave aside education approaches) we need to think in terms of substitutions – what else would the patron do with that time and that dollar? Arts educated patrons will place more value on an arts experience, so they are not the segment we are trying to reach. If we’re looking at the average Jack and Jill who will probably go to a movie or to a sporting event. They don’t value arts any more highly than these choices, and as some arts are available for free, it also encourages people to value it less in dollar terms. The only sensible choice we have (if we are not to make the suppliers reduce their prices) is to give people some kind of voucher. Once we have chosen a policy direction, the next step is to consider whether it is equitable and efficient. The “youth” voucher is about acknowledging that students are a market worth developing, but have lesser incomes. The thinking is that by experience of the arts, they will become inclined to value it more highly, and pay more/substitute less when the are older and wealthier. The equitable and efficient way would be to distribute every young person a multi-arts pass, with the government redeeming subsidy to the artist for every purchase. Has it occured to anyone that maybe the government should give less funding to the arts altogether. There are three good reasons for this. 1. If people want it, people pay for it. A friend of mine who earns $15 per hour as an apprentice manages to buy himself a $90 carton of JD mixed with coke every weekend on his very modest income. My point being: if he really wanted to go to the opera, he could but he doesn’t so there is nothing the government can do to make him or anyone else and I do not think they should. 2. Government doesn’t have money, it takes money. Therefore to fund artists they have to tax someone else. For the ordinary person this means limiting their freedom. So instead of say seeing the cricket, they are now pay a tax in order to receive the same dollar amount in theatre tickets they didn’t want or would have voluntarily paid for. 3. Most of the arts (although the term arts is very wide so I could be grossly generalising) occupations are a winner takes all scenario. For instance you may be only 1% less talented than Bono yet earn 1000% less per year than he does. Therefore funding the arts would (again gross generalisation but you define “arts” for me and I might re-think my arguement) have the effect of making the rich, richer at the expense of the taxpayers (who come from all walks of life, including poor!). Thanks for the comment. All good questions indeed. Of course, this post is not about whether or not culture should receive government funding, more about what happens when government does get involved. Also bear in mind that cultural funding is a very small part of government expenditure – usually less than 1 percent – so we’re not talking about a policy area with a great taxpayer burden.